So far we are all familiar with what 3D printing can provide to us as, but what if we were to tell you that there is something beyond 3D printing, something that goes not just into the ability to print in x,y and z but that also has a 4th element to it, this 4th element is called 4D printing (obviously). But what is 4D printing, well as we just mentioned we know that 3D printing takes its name by the coordinate system, x and y (your basic ink jet) and x,y and z for the added third dimension which gives us height, width and depth. Now the 4D dimension is not really on a coordinate system but in a different plane, time. And we are not taking about printing time but assembly time. Imagine if you could print a flat piece of plastic and then by adding an external stimulus, say water or heat that flat panel transforms into a cube, it’s a very simple approach but if you scale this thought to bigger more complex elements then you have a huge breakthrough in manufacturing and assembling processes. This new technology is being developed in The University of Colorado, Boulder lead by Prof. H. Jerry Qi (also a scientist). Prof Qi explains that the process works as follows, shape-memory polymer fibres are deposited in key areas of a composite material as being printed, by carefully controlling factors such as the location and orientation of the fibres, those areas of the item will fold, stretch, curl or twist in a predictable fashion when exposed to a stimulus such as water, hear or mechanical pressure. 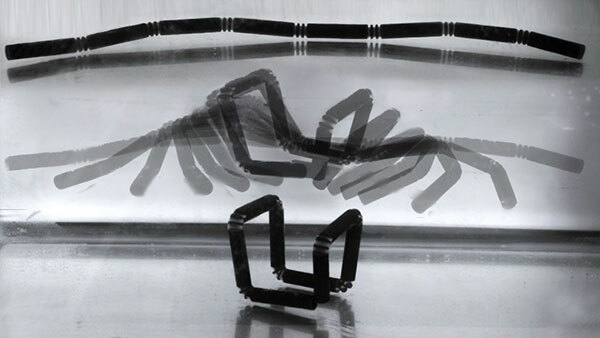 But this is not all that a 4D printed object can do, the research goes one step beyond that, Skylar Tibbits director of the MIT Self-Assembly lab presented items that could not just do all of the above but can be exposed to another external stimulus and create a completely different shape. Apart from this, and by using a new Autodesk software, Skylar and his team can produced components at nano and macro scale opening new doors in areas where this items could perform computing functions. This new technology has definitely the chance to reshape how we perceive today’s industry like space exploration or even other areas like arts or biology. If you want to see the material “perfom” in real time check out the video at the break.